I was looking for a book to get me out of an almost slump, and Garden Spells was the perfect one to delve in to - I got lost in Bascom and the Waverley family. Bascom, North Carolina, is a small town with quite the history, especially when it comes to the heritage of families. The Clark's are renowned for their sexual prowess, the Hopkins are known for their maturity and nature to date older women, the Matteson's are all about family and the Waverley's - the focal family of the story - have a gift of some kind, varying from member to member. At the start of Garden Spells, Claire Waverley is living life the only way she knows how by keeping to herself and her constant of routine. Sydney, Claire's younger sister, is running from her abusive husband, with child in tow, and returning to the only place she's ever known as home - Bascom, back to her childhood home, and her sister Claire. The two sisters haven't always seen eye to eye, and so the reunion isn't full of pleasantries, but as the story continues we see a bond form between the two that is lovely to read. Being back in one another's lives does wonders for both sisters and both Claire and Sydney pull from each other in order to develop as individuals. Alongside the story of building bridges, there is romance for both Claire and Sydney. Watching Claire fumble with falling in love for the first time, allowing someone to get close to her, makes for interesting reading and feels almost relatable. Whilst Claire is busy falling in love with the next door neighbour, Sydney is rebuilding her life with daughter, Bay, when romance unexpectedly hits her. There is depth to Sydney's arrival in town with former high school friends uneasy by her reappearance due to a first love from many years ago. It's safe to say love and romance are very central to the plot of Garden Spells. As is magic... Or the unexplained. The magical elements inside Garden Spells are unusual, but useful. I haven't really read anything like it. Claire has her magical garden, with an unpredictable apple tree and the gift of creating amazing dishes from the edible plants in her garden that have the ability to do certain things - i.e. Lavender raises spirits, rose petals encourage love and honeysuckle allows you to see in the dark. Claire has made a rather successful business as a caterer many thanks to her garden. Sydney has always tried to brush off being a little bit different, shrugging away from the Waverley legacy, but upon returning to Bascom she embraces her family name and her own ability of being able to tell things about a person just by their hair - this makes her a master of her craft, hairdressing. Whilst I enjoyed seeing how the main characters progressed throughout the story, the minor characters played just as important a part within the book. In fact, it is a minor character that I would pick as a favourite, and that is Evanelle. Evanelle is a Waverley too, although not technically immediate family, and she has the gift of needing to give people items. It seems rather silly and insignificant, but the items Evanelle shares with others always plays an important role in their future. Learning a little about her gift, how it came about, and how it impacts on Evanelle herself was one of my favourite things about Garden Spells. For someone who enjoys character driven plots, Garden Spells is an amazing read. However, if you like writing that is a little more lyrical then this wouldn't be for you. The author's writing is easy to read, concise, and tells the story simply. It is the magical elements, the plot, and the characters that carried me through. Garden Spells isn't the kind of book I'd automatically pick if giving someone a book recommendation, but I'd happily read more when it comes to the Waverley family. Oh, I remember wanting to read this a few years ago.. but then I forgot about it. It sounds like a really fun and different read though, so I'll try to remember it for when I need a break from all those YA novels on my TBR! Thank you for the recommendation, Jade! 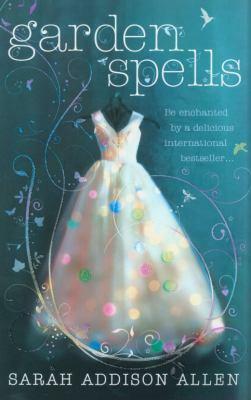 It is quite different to any other adult fiction I've read before - it's light and airy with a little whimsy thrown in. The characters really make the story though. I've already picked up the second Waverley book from my library! If/when you do get round to reading this book, I hope you enjoy! I have this one and have always been intrigued by this author...I should try it when I am in the mood for a little something different. Glad it helped get you out of your almost-slump! I'd recommend picking this one up when you're looking for a light read... Light reads always help me when I feel a slump coming on!